"What value is there to reading one, three, or more chapters of Scripture only to find that after you've finished you can't recall a thing you've read?" For years I've read my Bible in many ways... Chapter by chapter, reading a book 50 times, or reading from cover to cover, but I always struggled with forgetting what I'd read after I checked it off of my to-do list for the day. In 1990 (before the internet), Maurice Roberts wrote "Our age has been sadly deficient in what may be termed spiritual greatness. At the root of this is the modern disease of shallowness. We are all too impatient to meditate on the faith we profess....It is unhurried meditation on gospel truths and the exposing of our minds to these truths that yields the fruit of sanctified character." As I'm reading about the Spiritual Disciplines, the discipline of meditation has appeared in every one of the books. It is not the meditation of Eastern Mysticism, one of emptying your mind, but rather the complete opposite, it's filling your mind with a verse or passage and letting that soak in deeply. Though I'm still experimenting and learning what the "system" of meditation looks like, I can tell you it is an entirely different way to be in the Word, and the results have been amazing. What starts as reading, flows into study, which flows into meditation, then application, then praise and prayer. The flow is almost seamless. I'm not really sure what it looks like for everyone, but I'll tell you what it has been looking like for me. 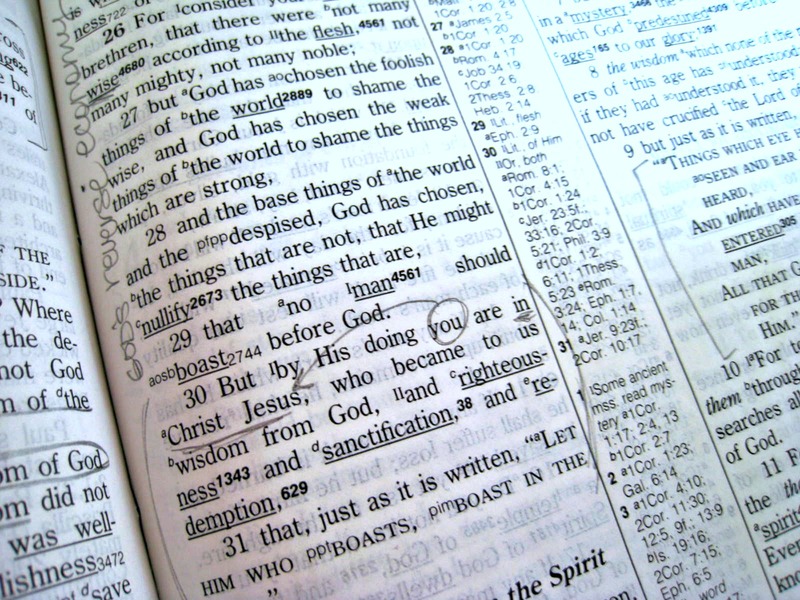 READ - After praying, it starts with reading a chapter in the Bible, and after reading, finding a verse that stands out. 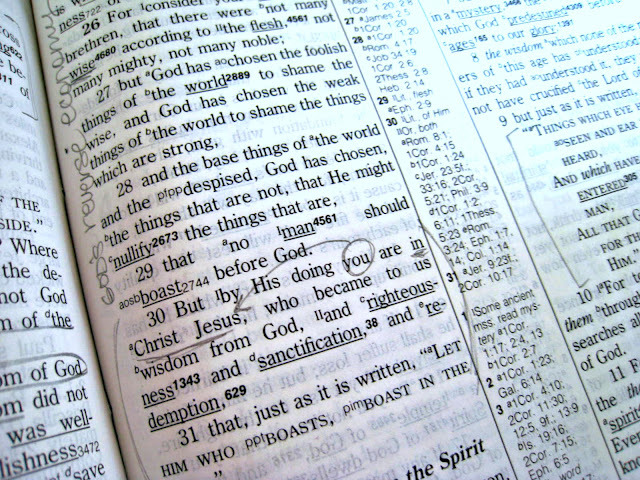 I underline or notate that verse then re-read it a few times emphasizing different words each reading. WRITE - Next, I write the verse in my journal, but not in paragraph form but outline form. Separating into lines that seem to make sense and put the different main points on a different line. 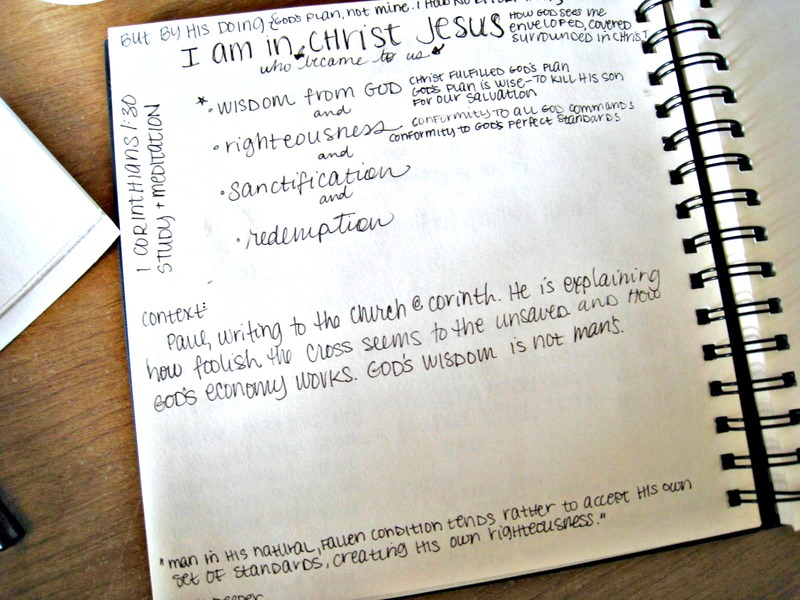 CONTEXT- Next, I read and write down the context in which the verse was found. I re-read the chapter or section surrounding the verse to try to fully grasp what the author was talking about. I want to be so careful not to pull verses out of context and warp them to what I think or want them to say. DEFINE - Now I pick some words (even some that I know what they mean) and pull out my dictionary and write the definition. Some of the words in my Bible are also notated with the original Greek words and definitions, so I will use those when possible to get a deeper understanding of the Greek. It's amazing how many Greek words have no equivalent words in English. Their language was so much richer than ours and these definitions really help. STUDY - Here I might look up some commentary for more confusing passages, or read the study notes in the Bible or for the Greek words. I also look up the cross references of other verses noted in the margins and write notes. QUESTIONS - Next I ask questions. How does this apply to me? What is it telling me about God? Me? Jesus? How to live? For example with this verse, I started by asking, what does "By His doing" mean? Then write down my thoughts "It means that it was God's plan. His effort. His action, His activity." QUOTES - There are some amazing theologians out there and I love to hear their insights. Some of my favorites are Matthew Henry and Charles Spurgeon and many other commentators on Blue Letter Bible or Bible Study Tools. It's so easy to find great thoughts on every chapter and verse in the Bible. Today is one of the best ages to study with great minds and sit under the teaching of them with just the click of a mouse. WORSHIP - After working through this (sometimes I work through just a part of the verse--like I did above--and will come back to it the next day) it leads naturally into worship. Putting it all down on paper and organizing my thoughts about what God has done leads me to fall down in worship, which naturally leads to prayer. The prayer usually mirrors my worship, thanking Him for what He had done and asking Him to help me in areas that the verse has spotlighted. This way of Bible meditation has been so beneficial and is completely adjustable for the time you have available. You can do each section in a few minutes, or take longer on each if you have time. You can do them all in one day, or break each apart into several days and make it work specifically for you and what you have going on in your life. 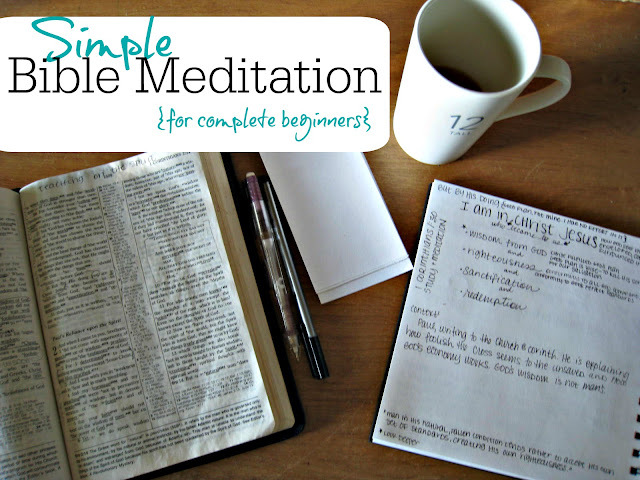 In the Bible studies I've written, I've included these methods of meditating on a verse or two and how to analyze and break it apart for deeper meditation. Be sure to subscribe on the sidebar to get your free copy of Ephesians and put this to work in your life! Wow, I have never read a better post on how to study... really study.... my Bible before. This is what I needed today. Praising God that He has used you in this way! Have you tried any other of Don Whitney’s mediation examples?